Ok, so I've needed a light over the bar I built in my kitchen. 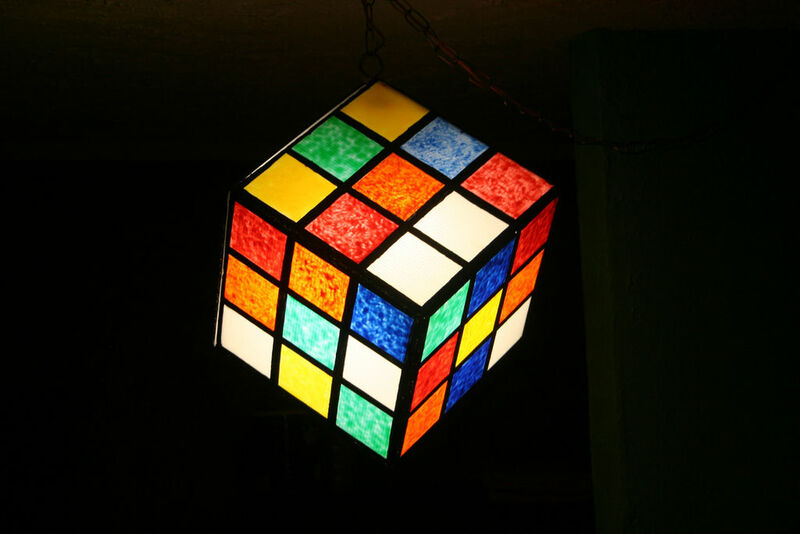 Instead of something conventional, right out of the box, I decided that it would be cool to have a Rubik cube style light. 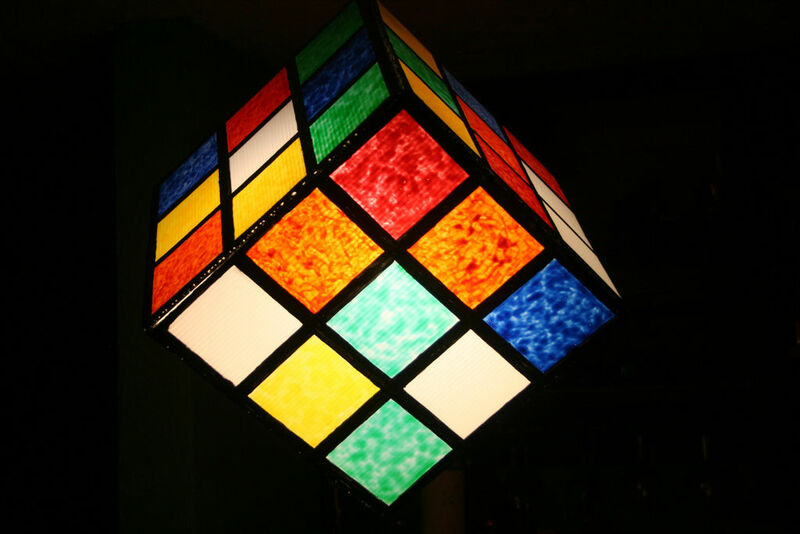 I came upon this idea by all the other Rubik cube projects - everything from costumes to furniture. But what really helped boost me in this direction was this instructable. However, weight & cost are an issue - the light will need to be very economical and light weight (as it will be hanging in the kitchen), and something easy to move about. And, the most important part, it has to fit into my eclectic sense of decor(?). I decided that I would weld a frame together out of quarter inch bronze filler rods, and that I wanted the cube to be 12" square. On top of that, I would need a light weight shell, and a light source. And a creativity to put together a welding jig for the cube's framework. Now that we have all the materials & tools, it's time to get busy making the cube's framework. I decided to make two 12" squared sides first. Each of these 12" squares use two pieces of 12" rod, and two pieces of the 11 1/2" rods. Then you connect these two 12" squares together using the remaining 11 1/2" rods. All of this equals a 12" cube. I assembled the make-shift "jig" on top of an old I-beam, that has been used as a welding table for about three generations. I used some scrape pieces of angle iron, a short piece of channel iron, a few welding clamps, and a quick square. I think the photos explain much better than I can, but if you have questions - please ask, I will do my best to help you along. Now that the cube's framework is assembled, it's time to attach a hanging point on it. I decided to hang it from a corner, just to give it an off-angle look. I took the extra 5" piece of bronze rod, and hammered a hoop out of it. Once I was happy with the shape, I welded it to a corner of the cube. I attempted to attach the hoop at a point where it would allow the cube to appears as if it were dangling from the tip of one corner. Now I had to figure out where and how to place the light fixture. Since I welded the placement ring on a corner of the cube, I thought it would be best to place the attachment point for the light socket on the same corner. I found an old 1/2" washer that fit the bulb socket that I was using. I used an angle grinder to make three slots in said washer. I then cut three pieces of bronze welding rod to weld to the frame. Now that all the metalsmithing is over, time to fit the plastic sheeting and get this sucker ready to hang. First off, I measured and checked to fit the cube near the center of the counter bar area. Then I mounted the hooks into the ceiling (making sure to place them on rafters), measured the chain and threaded the electrical wire through the chain. I made sure and left more than enough extra for the actual wiring that will be done later. Then, I put the light socket in the attachment point and wired that puppy up. Next, I focused on the outer shell of my soon-to-be awesome cube. The sheets of plastic came in a 20" x 30" size, so a little X-acto knife action is called for. However, before we get cut-happy a little math is called for. The plastic sheets are 3/16" thick, and we want the cube corners to look relatively flush (like we knew what we were doing), so this has to be figured into the sheet sizes. After the sheets are cut, it's time to attach them to the metal frame. Now is the time for you to decide which panel is going to be hinged for later use. I picked the side opposite the hoop just for ease of use. I used the X-acto knife and a straight edge jeweler's screw driver to cut small slits near the panel's edge, and used a small zip-tie to hold them in place. I started with two side panels, and worked my way around the cube, attaching four panels to the metal frame. A great way to cheat here is to use some blue painter's tape, or masking tape, to hold the corrugated panels in place. For the hinged lid, just attach it on one side, in an upper vector, and try not to pull the zip-ties tight. This will allow the lid room for motion - thus allowing you access inside the cube. Now that all the panels are in place, and lid is "hinged" in order for cleaning and eventual bulb replacement, it's time to fill in all the little cracks and gaps with ye ole hot glue gun. I'll have to confess - my hot glue-fu isn't what it should be, so my hot glue work looks a little rough. Ok ... a lot rough. But it gets the job done. (NOTE - there will be some touch-up and patching in the glue work later on). Now that all that is done, time to mark up the cube in squares and such. I just measured out the areas, marked with with a black Sharpie and used a T-square to grid of the sides. Then I started filling in the black parts of the cube. For this, I used Testors enamel model car paint (gloss black) and lots of patience. Little did I know that the colored squares would require even more patience .... I could only work on three sides at a time (due to the way I had the cube setting), so this took a day or three. And (this being referenced up above) after you paint the seems, you'll notice where you didn't quite fill in everything. At least that was the way it ended up for me. So, I had to pull out ye ole hot glue gun yet again, and do some filler work. Then some touch up painting. A few extra days added to the work schedule. As a piece of advice, if your hot glue skills are on-par with mine, take your time with the hot gluing - it'll save time in the long run. This part was one part paint mixture experiment, one part trial & error, and a few parts do over. First off I started with the food color and glue mixture (with a drop or three of hot water) for the yellow squares. Talk about taking a lot of time. Each yellow square got four or five thin coats each, but each coat in each square had to completely dry first. While giving the yellow a nice and smooth color, it was taking way too long (I've been told a time or two that I can be impatient at times. Who knew?). Ok, so I then when to the Mod-Podge / food coloring / a dab of hot water. I did orange first. Kinda liked it, but it was more difficult to get a smooth finish with this mixture. Instead of backing up to punt (ie, scraping off the orange), I decided that I kind like the stained glass / Tiffany lamp style texture it was giving. Next was red, which didn't work with just the food coloring. The best I could get was hot pink, so I decided to use a little acrylic paint (cadmium scarlet hue) mixed with Mod-Podge and a few drops of hot water. Perfect! So, for the other colors, I nixed the food coloring in favor of colored acrylics, and I continued with the daubed stain glass pseudo finish. 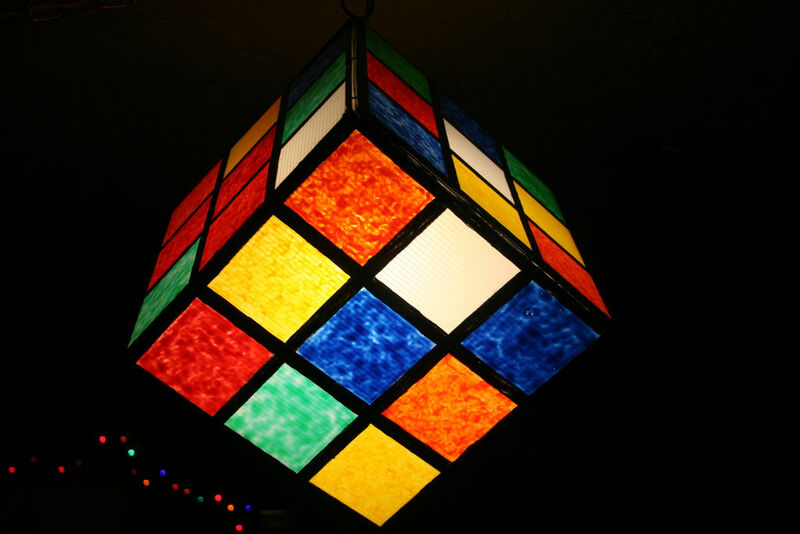 I thought I'd finished up, so I proudly hung the cube and illuminated it. And a few days later, the orange food coloring colors had faded. Almost away. So, I broke out some more acrylics, mixed up some bright orange, and re-coated the fading squares. Look our rechargeable led lights : http://rechargeable-led-light.com ! This is an awesome bit of nerdyness! That almost looks like Stained Glass; Awesome job ! Thanks! I was concerned about the "finished product look," but am very happy with the results too.